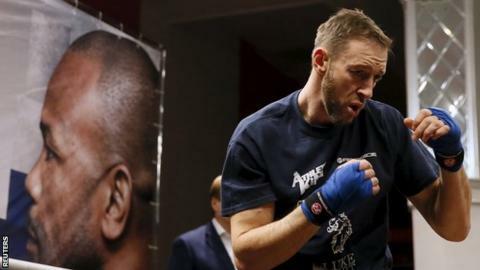 Welsh boxer Enzo Maccarinelli secured a fourth-round knockout win over Roy Jones Jr in a non-title cruiserweight fight in Moscow on Saturday. After an evenly matched opening three rounds, 35-year-old Maccarinelli stepped up the pressure and floored Jones in the fourth. The 46-year-old beat the count but failed to recover and a Maccarinelli uppercut put him down again to secure victory. Jones had won his last eight fights. The former four-weight world champion was fighting for the first time since he was granted Russian citizenship in October. The bout, which was held at the at the VTB Ice Palace, was originally billed as a WBA cruiserweight title fight. But the governing body's vice-president Gilberto Mendoza said no title would be at stake.